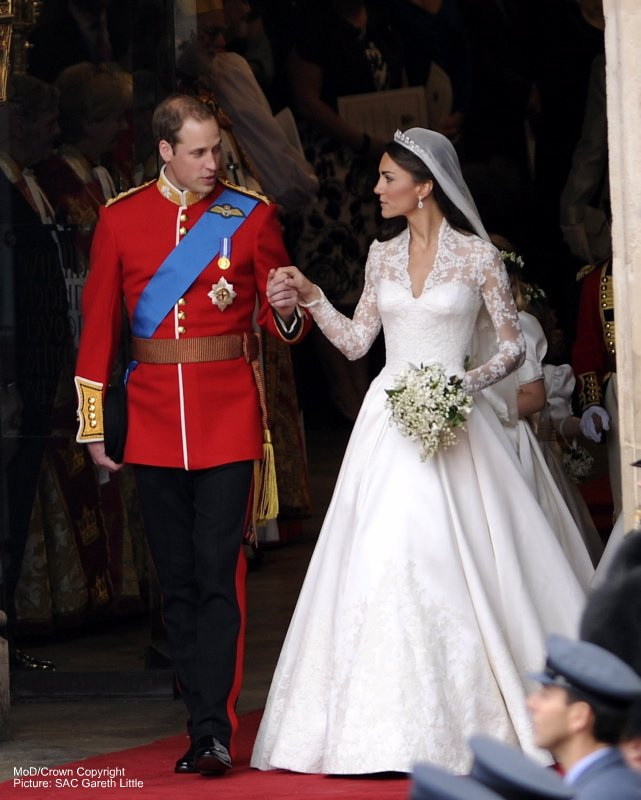 The most famous royal wedding of recent years saw Kate Middleton become an April bride. The love story of William and Kate is well known from the meeting at St Andrews University to the engagement in Africa. From the moment that Kate walked into the spotlight wearing Diana's famous ring, royal wedding mania took hold and by the time she arrived at Westminster Abbey to say 'I do' there were tens of millions watching and enjoying around the world. The dress, the flowers and the kiss all became instant memories. Seven years on, the Cambridges could well be marking their anniversary this year with a new baby in the house - their third child is set to join four year old Prince George and two year old Princess Charlotte in April. April is a month for duchess creation. The second marriage of the Prince of Wales to Camilla Parker-Bowles, nee Shand, in April 2005 led to a major debate about his second wife's title - one that still goes on today. It was announced that the bride would become Duchess of Cornwall and that's the title Camilla acquired from the moment she made her marriage contract in a civil ceremony at Windsor's Guildhall. The Queen wasn't there but she was in the front row just a few hours later as Charles and Camilla walked into St George's Chapel for their blessing ceremony. The marriage had followed one of the most controversial royal relationships of recent times and the wedding day itself had to be put back by 24 hours so that Prince Charles could attend the funeral of Pope John Paul II in Rome. Charles and Camilla have gone from strength to strength and they're about to mark thirteen years of marriage. Princess Alexandra of Kent might not be one of the most famous members of the Royal Family now but back on her wedding day in 1963 she was a regal superstar and had a marriage to match. Alexandra was the only daughter of the late George, Duke of Kent and his wife, Princess Marina of Greece, and a granddaughter of King George V and Queen Mary. When she said 'I do' to the Hon. Angus Ogilvy on April 24th 1963, she was a high profile royal with a packed diary (all these years on, her engagements tally is still high) and a big public following. The couple married at Westminster Abbey with the full carriages and crowned heads treatment and this royal wedding was a major TV event, broadcast around the world with a sizeable audience. Alexandra and Angus went on to have two children. He died in 2004.